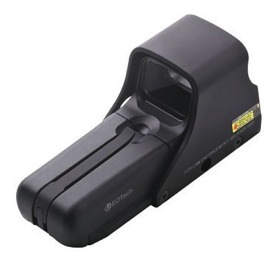 When I decided that my M4 needed a harder use sight than the Bushnell Holosight, the EOTech 552 was the model I stepped up to. I have now been using this excellent holographic sight for close to eight years on an M4 Carbine without any issues or problems to speak of. The 552 provides a similar reticle and setup that was present on the older Holosight in a much more durable and robust package. The most distinguishing feature is the “roll bar”; a hard metal shell that covers the top and sides of the sight. The standard EO Tech reticle provides a small 1 MOA dot centered in a 65 MOA circle for rapid target acquisition and to allow the shooter to shoot with both eyes open. The magic of the holographic weapon sight happens when the shooter is focused on the target and the reticle superimposes itself via an optical illusion. 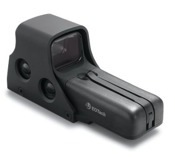 The sight is fully compatible with night vision and has a brightness adjustment setting which enables the shooter to adapt to any lighting condition while preventing wash out. The EO Tech 552 runs on inexpensive AA batteries, but the tradeoff is a shorter battery life than its chief rival, Aimpoint. The mount allows the sight to fit any Picatinny or Weaver type of rail. The EO Tech 552 is in use by various units within the US military, for a good reason; it is the best type of sight that can be had for the money. I run mine with a GG&G flip-up scope cover stamped with “Front Toward Enemy”.